Chiba Pedal's story delivers its message effectively to its viewers even in such a short span and few episodes with its usual animation and sounds. I just watched a Y.T. video a few days before about things that are illegal in Japan but the people do anyway and bicycle safety rules are mostly featured and I can just imagine this anime being aired every commercial breaks, which would really be appropriate, because it shows every do's and don'ts in (real life) cycling situation in Japan. I was smiling in every episode because they're totally cute and entertaining. 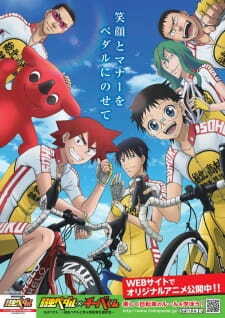 It brings out the lighter side of each characters especially the three seniors, Kinjou, Tadokoro and Makashima. It was so entertaining that I just thought it fell short of episodes and runtime although I know that this isn't the usual anime series but ONA. Hopefully, another ONA of this will be made and this will be aired in every country just for the love of bicycles. Thumbs up!